I had an interesting conversation recently with a friend who is exploring in his PhD studies (and of course his activism) the relationship between Political Ecology (as a scholarly discipline) and Decolonization (as a political project). This piqued my non-dogmatic interest, as each of these trends can be mired by certain dogmas (dogmas which are by no means found in every example of either trend, but appear enough to associate with them). On the political ecology end, a focus on the “systems” that weigh down upon environmental injustices (namely, capitalism and nation-state-based governance systems) and the interpretation of these through Marxist and anarchist/populist political economic lenses can lead to inadvertent ignorance of other axes of oppression and ecological destruction, which do not always or necessarily stem from states or capitalist economic classes. Political ecology can thus be overly structural; it can end up leaving out alternative forms of analyzing environmental issues (for example, dismissing spiritual dimensions or a gendered analysis of resource access). The influence of Marxism in particular on political ecology can at times be extremely Eurocentric in its categories of analysis. The thing is, both projects—political ecology and decoloniality—are so crucial for reaching towards a better world: we need to understand the (often systemic) problems that create dysfunctional human/nonhuman relations—i.e. environmental degeneration—in order to confront and transform those systems. 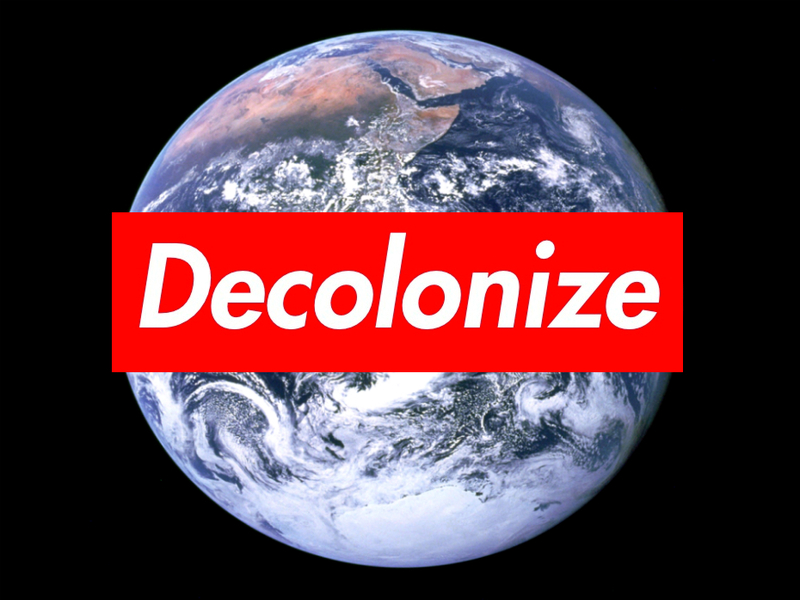 And we need to pursue strategies that actively decolonize the beliefs and habits of colonized and colonizer alike, while fundamentally undermining the structures of continued colonization (as in unequal North/South market relationships, climate change inaction, concentrated land ownership and control, and so on). But either project on their own is limited, and potentially alienating when pushed to describe or resolve all struggles everywhere. That is why I really appreciated my friends’ interest in finding a way of melding these two paths to change making. This friend also introduced me to other people he’s found to be on that same path. Silvia Rivera Cusicanqui is one such person—an anarchist, feminist, and historian from Bolivia. Reading this interview with her, I found many things to love about this woman! One of the most pertinent quotes is where she describes the idea of a “trivalent logic”—coming from the Aymara indigenous people of Bolivia, Peru, and Chile—which she understands “as opposed to Aristotelian binary logic”. Aymara philosophy is based on the “included third.” A is not B, and B is not A. But there are things that are A and B at the same time. In binary logic, one excludes the other. But when you have the logic of inclusion, you have enormous possibilities of intercultural action. Throughout the interview, Silvia shows herself to live and speak and dream an antidogmatist radicalism, by embodying this inclusive, trivalent logic. This isn’t same as “thesis-antithesis-synthesis” either, because it holds space for the contradictions that come with an “included third”. It is not a settlement of dichotomy, but a working through it. If we realize that few people in modern society could accurately be described as mere colonized or colonizer, perhaps we can start building a movement of “included thirds”, a movement that pushes past such counterproductive compartmentalization. For example, Silvia does not dismiss her own European ancestry as hopelessly “colonial”, while pursuing indigenous justice and the development of an indigenous worldview. She sees the contradictions inherent in being herself, a product of colonization and an opponent of it, and lives through these contradictions in a positive and humorous light. She says “We live the contradiction with joy”. She is not less indigenous because of her mixed heritage, nor is the European aspect something she seeks to reject or subsume in the name of “decolonization”. Similarly, Silvia also does not dismiss markets as hopelessly colonial, as some of my self-proclaimed anti-capitalist/anti-state friends do. Instead, she explains how (within the Bolivian context), she sees the indigenous markets as resisting the dominance of capitalist markets—acting she says “like a vaccination” against them! Much of the “peasant populist” literature in critical agrarian studies (and critical agrarian movements!) shares this analysis, seeing peasants’ sales in local markets as means towards greater autonomy, and against subservience to the global market. Many activists in the United States, in contrast, seem attached to dualistic black-and-white thinking, e.g. the many anti-capitalists who reject all NGOs as part of the “non-profit industrial complex”, or mission-oriented business as “neoliberal”—without considering seriously what these NGOs and organizations actually do. The very important and useful critique of NGOs (of INCITE!’s book “The Revolution Will Not Be Funded”) has at times been used to justify a dogmatic rejection of all efforts to create (certain kinds of) organizations as vehicles for change. Decolonial thinking might cause me to question anything that emerges from coloniality, including organizational forms with suspect histories. But only with a truly informed political ecological analysis of who does what, who gets what, and what are the effects on non-human nature and human-human relations, can “decolonial” critiques go beyond dogma, and become more grounded in the realities of what is causing harm, what is mitigating it, and what can be done to decolonize. I hope to see greater emergence in the coming years of an “included third” of political movements informed by but not limited to both decolonization and political ecology ideas. These movements, by acting from thoughtful analysis and concrete social positions, will likely dismantle the theory-driven limitations of decolonization and political ecology as scholarly pursuits: it is praxis that brings out the best of both worlds and creates new possibilities for liberation. I must say in its defense that political ecology has already evolved much in its first 30 years as a field of study, as has decoloniality over its years of scholarship and practice. Both fields are fields of scholarly inquiry, and fields of action. Perhaps it goes with out saying, butI have found those who trend more on the “action” side to be less dogmatic in their interpretations of each respective framework, and in their analyses that emerge from their interpretation.